Jonathan’s confidence grew so much that he often helped to lead the dancing along with Dance Leader Jen and Dance Artist Donna. 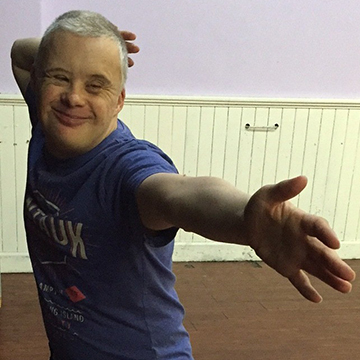 He enjoyed leading the group so much that he decided to enrol on DanceSyndrome’s Dance By Example training course, to learn how to co-deliver community dance workshops. DanceSyndrome has enabled Jonathan to make friends, have fun and get some exercise. Training as a Dance Leader has made him feel important, his confidence has grown and he is now following his dream.